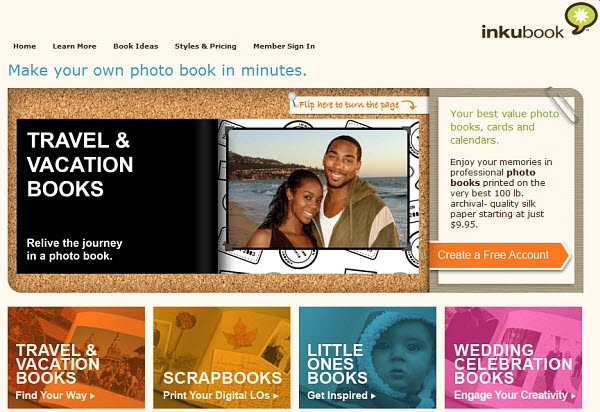 If you recall my photo book round-up review, Inkubook fared quite well - I liked their Web-based book building system, and their paper, print, and cover quality were all solid. What with summer holidays now over - and the winter holidays fast approaching - Inkubook and I thought it would be a perfect opportunity to give away a few free photo books! We have five (5) 8.5" x 11" classic landscape photo books to give away, 20 pages each, with shipping included. That's a $29.95 USD value (plus the shipping), and if you want to add more than 20 pages to your book, you'll simply get a $29.95 credit and free shipping subtracted from your total. Nice! How can you enter? All you have to do is post a message telling me what you'd put in your photo book - a recent summer vacation? A new addition to the family? Celebration of a special moment in life? Tell me what you'll make, and post one of the pictures that you'll be putting in the photo book. It can be anything - keep it clean - and it's easiest to just post a link in your post so you don't have to mess around with HTML. We don't host images inside our forum, so you can use any one of the many free image hosting services out there to upload your image then post a link to it in your message. The five winners will be chosen randomly when I shut down the contest on November the 12th at 12pm GMT -7. Winners will be contacted via forum private message, so make sure you have email notifications turned on. Have fun, and let's see those ideas!